Editor’s note: In order to give a full range of perspectives on Proposition 2, we contacted all four egg producers in our market. What follows is based on the most substantive interviews we conducted. Jesse Kuhn of Marin Roots also went on record in support of the proposition; David Evans of Marin Sun Farms was out of town. 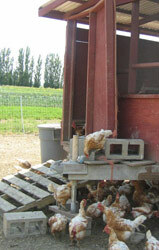 “I don’t know what ‘happy’ means to a chicken,” says Steve Mahrt of Petaluma Farms. The third generation egg farmer heads the company behind the Petaluma, Rock Island, Uncle Eddie’s, Judy’s Family Farm and Gold Circle brands. Mahrt says he recently invited a veterinarian up to his farm―where they produce around 4,000 dozen eggs a day―to see both the caged and cage-free chickens Petaluma raises, for himself. “Even the vet, a Prop 2 proponent said, ‘I can’t tell if the chickens are any happier out of the cages,’” he recalls. Mahrt has raised a portion of his chickens in cage-free environments for 25 years, but he opposes the Humane Society-sponsored Proposition 2, which would require chickens raised for eggs to be given enough space to “turn around freely, lie down, stand up, and fully extend their limbs,” because it strikes him as well-intentioned but bad for business. Mahrt and others at Petaluma Farms, including Stan Keena, who sells the eggs at the Ferry Plaza Farmers Market, are worried that if the proposition passes, producers in other states will flood the California market with cheap eggs, while farmers here will be hampered by the need to invest in more space―a cost that will run between 12 to 28 cents per dozen, according to one UC Davis study. Mahrt says he doesn’t want to have to pass that cost on to his customers and says that estimate strikes him as way too low. Prop 2 would require increased space for all animals kept in poultry facilities, sow gestation pens and veal crates by 2015. And since there are comparatively few hogs or calves raised in the state, egg-producing hens are at the center of the discussion. Just how much space would that mean? Mahrt believes he will be asked to give every hen nearly five square feet of room (the equivalent of their wingspans, or about 26 inches, squared); it’s a requirement he says would force him to expand even his cage-free hen houses. “It’s a very modest measure,” says Walker. “Basically, caged chickens will go from having a space the size of ⅔ of a sheet of letter size paper to one the size of two sheets of letter size paper.” Walker is an outspoken advocate of Prop 2; he signed on to the official rebuttal to the arguments against the proposition and has spoken to a number of media sources about his stance. Any way you boil, fry or scramble it, Prop 2 has implications that reach far beyond California. Several other states have passed similar laws relating to pigs and calves, but this is the first time such a ballot measure has been raised in relation to egg-laying hens. 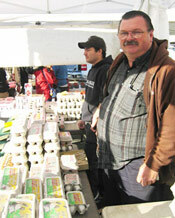 Pictured above, from top: 1) Stan Keena sells eggs for Petaluma Farms at the Saturday market 2) Pasture-raised chickens at Eatwell Farms.